In Kazakhstan, every fifth citizen belongs to the younger generation. Since young people are a fundamental asset to Kazakhstani society, it is critical for them to be equipped with the expertise and skills necessary to succeed in a competitive global market economy. As the experience of many other countries has shown, youth can quickly turn from an asset to a liability if left without proper education and jobs. This paper examines the worrisome rising number of youth from southern Kazakhstan who are not in employment, education, or training (NEET). In OECD countries, in particular, the NEET category is being used as an indicator of youth marginalization and disengagement. According to a recent OECD report, although 96 percent of young Kazakhstanis are employed, they are often engaged in low-quality, low-paid, and high-risk jobs. Such low-quality employment is often found in the informal economy, which employed about one-third (28 percent) of young Kazakhstanis in 2016. Another segment of youth is self-employed. At the same time, the exact number of NEET varies from region to region, with southern oblasts having the highest rates. There is almost no research devoted to the study of NEETs in Kazakhstan and no information is available on their socio-demographic profile (category, age, poverty, time as a NEET, etc.). 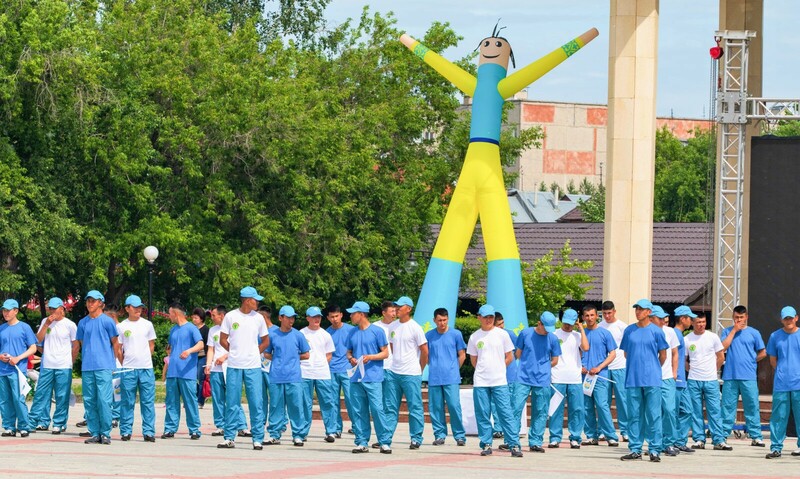 Thus, current employment data—which measure only formal employment—do not capture the real situation of the youth labor market in Kazakhstan, with the result that the government’s numerous initiatives directed toward youth education and employment fail to reach a sizable number of young people. Dinara Alimkhanova is a young researcher in the field of education, specializing in vocational education and training. After graduating from the Graduate School of Education at Nazarbayev University (Kazakhstan), she worked at a think tank under the Ministry of Education and Science of the Republic of Kazakhstan. She has held internships at the European Training Foundation (under the European Commission, Italy) and UNESCO (Israel) focused on youth education and training, matching and developing skills in the labor market, getting early school leavers back into education, etc. In a comparative context, Kazakhstan has a lower NEET rate than its neighbors and OECD countries (see Figure 1). In OECD countries, a high NEET rate is strongly correlated with low educational attainment: in 2016, the vast majority (85 percent) of all NEETs had no tertiary education. That being said, in seven OECD countries (Belgium, the Czech Republic, Denmark, Estonia, Greece, Japan, and Slovenia), over half of NEETs were between 25 and 29 years of age, indicating difficulties not so much in accessing higher education as in transitioning from school to work, often due to a lack of work experience and low qualifications. A high NEET rate may have a number of negative short-term as well as long-term consequences for a society. When young people struggle to find permanent employment, it puts them at a higher risk of poverty and lower levels of well-being. “Left behinds” have poorer health and are more likely to engage in criminal activity. This segment of the population also tends to have lower levels of trust in socio-political institutions and the government. Today, most countries accept the International Labor Organization’s (ILO) definition of and methodology on NEET. According to the ILO, the NEET rate consists of the percentage of the population of a given age group (15-29 or 15-24) and gender who are neither employed nor involved in further education or training. The data are normally calculated through the ILO’s Labor Force Survey (LFS), a standard household-based survey of work-related statistics, as the percentage of young people who (i) are not employed; and (ii) have not received any education or training in the four weeks prior to the survey. In 2017, young people—those between the ages of 14 and 29—constituted almost one-fourth of the total population of Kazakhstan (22 percent, or nearly 4 million). Figure 2 shows that by 2030, the number of young Kazakhstanis aged 16-24 is expected to increase by 30 percent. About 57 percent of Kazakhstani young adults reside in cities and more than half are men (50.4 percent). Over one-third (35 percent) were in education and more than half (55 percent) were active labor force participants in 2016. According to the labor force statistics from that year, 96 percent of all youth were employed, while the remaining 4 percent were unemployed, a common dynamic in the youth labor market in recent years. However, scholars debate the degree to which these figures reflect the reality of youth employment. Some argue that the high level of youth employment is an illusion because many young people work in the informal economy or are self-employed. Figure 3 offers a more detailed picture of employed youth, breaking that category down into employees and self-employed workers. In Kazakhstan, the organization that collects NEET data for the Labor Force Survey is the Statistics Office of the Republic of Kazakhstan. NEET data are available from 2001 to 2017, but no empirical research has been conducted since that time. As of 2016, approximately 357,000 Kazakhstani youth (9.2 percent) were found to be neither employed nor enrolled in any educational institution and thus were classified as NEET. The proportion of NEETs gradually declined between 2001 and 2011, a decrease that can be explained by a reduction in youth unemployment, which is a major contributor to NEET (see Figure 4). Since 2012, however, the share of NEETs has been growing. More young Kazakhstanis have begun to withdraw from education and the labor market. This shows that, in addition to the unemployment situation, several factors have combined to drive youth to drop out of education or work. One explanation based on the OECD’s findings is that the informal sector played an illusionary role for some socio-demographic groups. In other words, informal jobs allowed some people to be considered “employed,” when in fact they were neither self-employed nor hired by someone else. A number of other studies indicate that this tendency is a global one: NEET growth began in the aftermath of the financial crisis and has not stabilized. Many young people still face the challenge of a skills mismatch: they lack the competencies that would make them attractive to employers. Although the proportion of NEETs varies across the country, Southern regions tend to have the highest numbers of NEETs. Officially, Southern Kazakhstan includes the Almaty, Zhambyl, South Kazakhstan, and Kyzylorda regions, as well as Almaty city (see Figure 5). Although Mangystau oblast belongs administratively to West Kazakhstan, I decided to include this oblast alongside the southern regions, since it has the highest proportion of NEETs and shares common cultural, social, and demographic features with the other southern oblasts. I also considered including Karaganda oblast in the study due to its high NEET rate, but the region’s geographical location (Central Kazakhstan) and diverse socio-economic characteristics make it too different from southern Kazakhstan. From the location perspective, urban areas of the country’s southern regions show slightly higher rates of NEETs than rural areas. This may be explained by the fact that youths seek better jobs or educational opportunities in the cities and remain there even when neither is forthcoming. Only in South Kazakhstan oblast and Mangystau oblast are there more rural NEETs than urban ones. Generally, both urban and rural areas in southern regions have high proportions of NEETs, ranging from 6 percent in South Kazakhstan oblast to 16.5 percent in Mangystau oblast (see Figure 6). The main explanation for this tendency may be the widespread informal and/or self-employment economy present in the region. In this paper I contend that several economic and social factors have contributed to the increase in the numbers of NEETs in southern urban areas in 2010-2016 (see Figure 7). There are several factors that can explain this situation of high rates of NEET in southern regions. First, the shadow economy (most of the shadow economic activity in the country is concentrated in southern regions) can contribute to a low employment rate among youth. Second, a large number of school leavers move directly to the labor market without training or job qualifications, especially in the south of the country. The transition from compulsory schooling to higher education or employment is an important move for all young adults. In 2016, more than 17,000 high school graduates—14,000 of whom resided in southern regions—did not continue their education in universities or vocational schools. The majority (75 percent) of those in southern regions moved into the labor market, where they worked without any qualifications. The remaining 25 percent became unemployed or did not enter the labor market due to other social factors (such as disabilities). Despite the fact that the number of unqualified youth entering the labor market has been decreasing in recent years, it remains high (see Table 1). Youths who choose to take time out before entering formal higher education or employment usually struggle to either return to education or find work. This may contribute to the increase in the number of NEETs in southern regions. Third is youth migration from rural districts to cities. This tendency is visible in southern regions, where youths, for a variety of different reasons, tend to leave villages and settle in cities (see Figure 8). One of the main drivers of youth outflow is poor access to proper education in rural areas. Indeed, the vast majority (87 percent) of vocational schools are located in cities. Almost half of Kazakhstan’s universities (59 of 125) are also located in southern cities. Thus, school graduates in search of further education have little choice but to move to larger cities. Accordingly, Makhmutova’s study finds that 57.4 percent of youth who have settled in Almaty city originally came for education. They have stayed for 5-10 years (i.e. even after completing their studies), considering that they have better employment prospects and better access to social services in the city. These employment prospects appeal even to young people without higher education: Makhmutova found that more than half (54 percent) of young migrants to Almaty city came simply because they did not have jobs in their previous locations. Fourth, it is probable that many ethnic repatriates (Oralmans) contribute to the NEET rise. The vast majority (80 percent) of ethnic repatriates thus settled in the country’s southern regions. People of working age make up 55.6 percent of them, and many of them belong to the younger generation. Data on their education attainment show that only about one-third of them had higher (8.8 percent) or vocational education (20.5 percent) qualifications; 60.9 percent arrived with general secondary education, while 9.8 had attained no education level. The fact that a high number of ethnic repatriates with very low educational attainment have settled in the southern oblasts may have contributed to the increasing numbers of NEETs in these regions. To date, relatively little attention has been paid to young women who are NEET all over the world. In order to better target integration policies, it is highly important to study the profile of NEET women and their needs in the labor market. – Promote reconciliation between formal work and private and family life for women through part-time work, parental leave, online remote work, etc. – Evaluate the effectiveness of existing formal short-term and informal education programs. Effective programs should be accredited in a way that will allow young people to use them as a springboard for further education or career progression. – Encourage local non-governmental organizations to assist in improving NEETs’ hard and soft skills. Such efforts should be monitored to observe their outcomes and determine whether they are worth pursuing. Organisation for Economic Co-operation and Development (OECD), “Building Inclusive Labour Markets in Kazakhstan: A Focus on Youth, Older Workers and People with Disabilities,” 2017. The first and only study is D.E. Ashimkhanova et al., “Guidelines for Working with Youth in the NEET Category,” 2017. Sara Elder, “What Does NEETs Mean and Why is the Concept So Easily Misinterpreted?” ILO Technical Brief 1 (2015). Ministry of the National Economy of the Republic of Kazakhstan, “Demograficheskii prognoz Respubliki Kazakhstan: osnovye trendy, vyzovy, prakticheskie rekomendatsii,” 2014. Currently available only for youth aged 16-24. “Labor Force Indicators,” Statistics Office of the Ministry of National Economy of the Republic of Kazakhstan, 2016. “Labor Force Indicators,” Statistics Office of the Ministry of National Economy of the Republic of Kazakhstan, 2017. “Employment Information of High School Graduates (After Grade 11),” National Education Database, 2016. Meruyert Makhmutova, “Vnutrenniaia migratsiia molodezhi v Kazakhstane: na primere g. Almaty,” 2013. Main photo by Shutterstock, Petropavlovsk, Kazakhstan – July 06, 2018: Holiday “Twenty years of Astana”, the main area of the city of Petropavlovsk.